If you are reading this, you are probably thinking to yourself, “This just isn’t possible.” Today, I hope that my story inspires you to take action in your own debt journey, to feel hope, and to finally see the light at the end of the tunnel. If you follow me on Instagram, you know a lot about my story. I have been sharing my financial journey for over three years over on the platform. For the last year, I have posted a video every single day detailing my debt payoff journey. If you are not familiar with my story, you are probably reading this article out of pure curiosity to find out how I did it. So, let’s start at the beginning. My debt journey started when I was in college. I was one of those students that accepted more financial aid than I needed, and with that, came student loan debt. The thing that made my situation even worse was that I also suffered from self-confidence issues. I struggled with my appearance, and most days felt like I didn’t fit in. To compensate for these feelings, I used leftover financial aid to spend money that wasn’t mine. Whenever I was feeling sad or depressed, I would go to the mall and buy clothes. To make myself feel better, I would spend money on getting my nails done, going to tanning salons, and visiting expensive hair salons. I felt like I was fixing my outside appearance, but I still hated myself on the inside. My spending quickly turned into a downward spiral. I would feel good about myself for a short time, but before you knew it, I was back to spending money on ridiculous things, continually needing to find happiness from the things I bought. By the time I graduated college in 2011, I had racked up over $35,000 of student loans, and over $21,000 of credit card debt. The biggest regret that I have about this period of my life was that I worked full-time during the day and went to night school. If I had been smart with my money, I could have relied solely on my income, and left school with zero debt. Months after graduating with a finance degree, I was fortunate enough to get a job working in the finance industry. Four days before my first day at the new job, I was in a severe motorcycle accident. I ended up with a shattered wrist, a bruised pelvic bone, and two black eyes. I spent three days in the hospital and had to have major surgery. The most devastating factor about this part of my story is that I didn’t have medical insurance or motorcycle insurance at the time of my accident. Shortly after leaving the hospital, and just weeks into my new job, the hospital bills started rolling in – $59,000 in total. Not only did I have to start my new job without a working right arm (and I am right handed), I had to spend the first few months of my new job completely overwhelmed with my financial mess. Every day I would go to work, working in the financial industry, feeling completely embarrassed and defeated about my own money. With my student loans, credit card debt, and now with new medical debt, I was looking at over $100,000 of debt total. Once I realized how bad my situation was, I quickly realized I could not keep up with my minimum payments. I called the hospital desperate for help, asking if there was anything that I could do about my medical debt. Luckily, they allowed me to fill out a financial hardship request, and it was accepted. I am blessed that the hospital I went to cares for people and their health needs regardless of their ability to pay. Due to my financial hardship request, my medical debt decreased from $59,000 to just $13,000. After my medical debt was decreased, I called every creditor and negotiated a payment plan. At the time, I had five separate medical obligations. My medical debt ranged from $500 to $4,000 for each debt, but my monthly payments were very low, $5 to $25 every month for each. After spending a few months at my new job, my financial advisor (and boss) told me I needed to create a budget. Even though I spent four years getting a finance degree, I never created a personal budget for my money before. The first thing I did was write down all of my debt. I wrote down everything that I knew about my debt – interest rates, balances, and due dates. I also wrote down every expense that I had. Once I saw the numbers down on paper right in front of my face, I realized how bad my situation really was. I could not afford all of my expenses on the income I was currently making. I spent the next year making the minimum payments on my credit cards and spending a year in forbearance on my student loans. Forbearance is when your student loans are temporarily suspended, but your interest continues to accrue. Unfortunately, I felt it was my only option as I could not afford my student loan payment. I had to sit back and watch my student loan balance increase due to interest, rather than decrease. During my first year of budgeting and dealing with debt, I created multiple budgets that failed, and I failed with tracking my debt payments. Honestly, I had so many, and it was hard to keep up with them all. 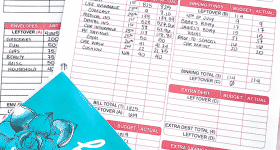 I tried every budgeting method that I came across, hoping one would be saving grace. The calendar method, the half payment method, percentage budgeting, the cash envelope method, nothing seemed to stick. I would start one budget, only to give up and start another. During my first year, and throughout my financial journey, I struggled with credit cards. I would pay one off, only to rack it back up again. It became very apparent that the reason behind my credit card debt was not due to lack of income to pay them off, but instead spending triggers. My entire financial journey has not been just about the numbers. It has also been a personal discovery as well. Over the years, I have learned to love myself for who I am, and to be genuinely comfortable in my own skin. By recognizing and being truthful to myself about my spending issues, and why I spent money I didn’t have, I was able to address the problem. I picked up long-distance running to help with my spending triggers. When I was feeling bad about myself, instead of going to the mall or spending money, I would throw on a pair of running shoes and go for a run. After finding ways to deal with my spending triggers, staying motivated to my debt journey became that much easier. In 2012, my son, James was born. There will never be the right words to explain the feelings that I felt that day, but from that day forward, my financial journey was forever changed. It was no longer about just TRYING to manage my finances. I HAD to manage my finances. For the first time in my life, another human being was utterly dependent on me. My son has been the reason behind my story from the very beginning. He is my motivation for staying strong, dedicated, and focused on WHY I am doing what I am doing with my money. I have learned that nothing is more critical on a debt payoff journey than finding a reason for hope. Your WHY and purpose is your guiding light and is the main reason you will succeed. For the next several years, I managed to get by with a monthly budget. I still failed all the time, but I was slowly learning how to organize my financial plan. Learning how to budget my money successfully before tackling my debt, helped me tremendously. You see, you can’t begin to address your debt until you know how to make your money work for you. I realized quickly that a monthly budget was not going to work for my life. I started to think about all of the different budgeting methods that I tried throughout the years and the essential parts of the techniques that I found successful in my own life. Through this process, I developed a budgeting method that I could finally stick to and the budget that finally showed me signs of success – The Budget-by-Paycheck method. After a few months of being successful with my budget, where I could finally see signs of progress, I began the process of creating a plan of attack for my debt. When I started getting serious about paying off my student loans, car, and medical debt, I had to face my fear of seeing the real truth behind my debt situation. To be honest, for the longest time, I made the minimum payments on my debts but never looked them as a whole. I was scared to see the big picture, but I also knew that if I didn’t own up to my debt mess, I could never begin to tackle it. It had been a couple of years since I last saw all of my debt in front of my face, and I knew that it had only gotten worse. So, I started the process again. This time, I didn’t just focus on my debt, but the entire financial picture. I made a detailed debt list, and instead of trying to pay all of them off, I focused on one debt at a time. The first plan of attack that I used to pay off my credit cards was the snowball method. Since this was my first attempt at paying off all of my credit cards, I knew that I would find motivation by tackling the debts with the smallest balances first. It took me over a year and a half to pay off all of my credit card debt using this method. My budget was stronger than ever, and with a real step-by-step plan for my money, I was able to tackle it fairly quickly. I was no longer wondering where my money was going, and for the first time, I was telling it where to go. With the combination of my income with my husband’s salary at the time, I was also able to pay off all of my medical debt. Luckily, during the beginning of my financial journey, I didn’t have a car payment. I drove an older Mazda Protege that was paid off in 2010. To celebrate paying off my credit card and medical debt, I finally felt like I had enough income to buy a new car. I did entirely no research, went down to the dealership, and picked out my dream vehicle. The dealership took my Mazda as a trade-in, and I drove off the lot that same day with my new Jeep. Nothing could prepare me for what happened next. I don’t talk about my divorce very often on The Budget Mom. Being a divorced mom is still something that I struggle with every single day. But I also think that it’s important to talk about because it played such a massive part in my debt story. Shortly after buying my new vehicle, I ended up separating from my husband and went through the divorce process. It was a terrifying & sad part of my life. Not only did I have to learn how to manage my money on one income, but I also had to leave the place that I called home for over six years. I had to find a new place to live with no savings. Except for a few boxes of clothes, and some personal possessions, I was not prepared to start over. During this part of my life, I made a lot of bad financial decisions. I bought everything for my new apartment on credit and used debt to get by. If you follow me on Instagram, then this is where you probably thought my story began. During 2017, I could see myself slipping back into old spending habits, and so I decided to take another look at my debt, which now included new credit card debt. At this time, my debt included student loans, credit cards, and a car loan totaling over $77,000. Luckily, I had a working budget, and I was on top of all my expenses. Even with a working budget, I knew that I had to create a new plan to pay off my debt. I researched different methods for paying off debt and found this Debt Payoff Calculator. Using this calculator to come up with a plan to pay off my debt was an eye-opener. Not only did it show me the different options for paying it all off, but it also showed me what my debt journey would look for each option (snowball vs. avalanche method). By looking at both debt payoff methods, I could compare interest paid over the life of my debt, how much I could save, and how long it would take to pay it all off. After seeing how much interest I could save over the life of my debt (over $13,000), I decided to use the Avalanche method. In June 2018, I announced my real debt numbers to the world on Instagram. For the longest time, I kept silent about my debt, too embarrassed to say it out loud. I also knew that if I continued to stay silent, I would never hold myself accountable to tackle such a massive amount of debt. As a financial professional, people assume we already have everything figured out. But I didn’t. It was embarrassing to reveal the truth about my financial life, but it turned out to be one of the best decisions I made during my financial journey. Overnight, I was flooded with messages of encouragement, and support. For the first time since my divorce, I no longer felt alone in my journey. In 2016, I started The Budget Mom. You can read all about why I started TBM here, or watch the video on my Start Here page to learn more. As I worked through my budgeting and debt journey, I wanted to share with the world the helpful information that I learned along the way. All of the essential information that I wish I would have known about when I first started my financial journey back in 2011. As I started sharing my personal finance journey with the world, along with the psychological triggers behind money management, my hobby of blogging turned into a growing business. As my business grew, I used every cent that I made and threw it back into my business so I could help even more people. For over three years, I worked a full-time job and ran my business in the morning and at night. I went from being a single mom wondering how I was going to make the minimum payments on my credit cards to owning a profitable business. I decided that I was going to use every dollar of my business income, after business expenses, to throw at my debt. With my debt avalanche method in place, I finally started making real progress with paying off my debt and seeing the benefits of my hard work. During 2018, TBM grew rapidly. I went from just over 2,000 followers on Instagram at the beginning of 2018 to over 100k in just over a year. I’m not going to lie. Learning how to manage my extra income was hard. The spender in me was hard to control and learning how to stay dedicated and critical with what I spent my new income on became essential. People assume that the more income you make, the easier it is to pay off debt. That isn’t always the case. Sure, you have the opportunity to pay off more debt, but that doesn’t mean the opportunity becomes a reality. You could make a million dollars from your business tomorrow, but you could also spend a million dollars tomorrow. Learning to make conscious & smart decisions with my income had a significant impact on how much debt I was able to pay off, and how fast I accomplished my debt freedom. I didn’t want all of the sacrifices I made over the past three years building my business to be for nothing. I wanted it to count towards something. To truly make a positive influence in my life. So, even though my income continued to grow, I challenged myself every day to live on less, so I could throw that much more towards my debt. I learned to live off of my day job income, while every dollar from my business was used for financial goals. After spending so much time learning about myself and my spending habits, I also learned things about myself that helped me save even more money. For example, I thrive off of savings challenges. The months that I was able to save the most were months that I created savings challenges for myself. Using the cash envelope method has helped me not only keep my spending under control, but it has allowed me to create savings challenges from my cash envelopes. For example, I have learned that just because I have allocated a certain amount of cash for a specific category, doesn’t mean I have to spend it all. Now, I consistently save over $300 every month from my cash envelopes. I feature all of my savings challenges over on my Instagram for people who also want to challenge themselves to save more cash. Paying off $77,000 of debt in 8 months isn’t impossible. If you are saying to yourself right now, “I don’t own a business. I don’t make that much income. I can never pay off my debt that fast.” You CAN. You just have to be willing to put in the work. No matter what your income may look like, you can take steps to start paying off your debt today. The first step is finding your WHY & your true motivation. Ask yourself WHY you want to improve your financial life? What are you fighting for? Use this motivation when you make mistakes or when you have financial setbacks. I can’t tell you how important it is to establish your purpose before you take the next step. Your WHY is what you are going to lean on when things seem impossible. It’s the reason you are going to keep pushing forward. It’s the underlying reason why failing or giving up is NEVER an option. My son is only six, but I couldn’t have accomplished my debt payoff without him. He was my constant reason WHY, and without that, I wouldn’t be where I am today. The second step is creating a budget. To tackle your debt, you have to know everything about your finances. How much extra income do you have every month to throw at your debt? Where do you need to cut spending so you can pay off your debt faster? The third step is facing your fear. You have to be able to write down every debt you have, how much you owe, your interest rate, and when each payment is due. The fourth step is creating a plan of attack for your debt. Figure out which method you would be the most successful with using, and tackle it head-on. Use that plan to stay on track. The fifth step is figuring out ways to pay off your debt faster. Can you find ways to earn more money? What expenses can you cut from your budget, so you have more income to throw at debt? If you aren’t willing to put in the work or make sacrifices during your debt journey, you have to be a peace with paying it off at your current rate. During my financial journey, telling myself “it’s impossible” was never an option. You have to believe in yourself enough to strive for the unimaginable. I so much appreciate hearing the whole story and all the bare-faced honesty it comes with. It is very encouraging to hear other people’s struggles and challenges because it reminds us we are not alone, not unusual and there is hope. Thank you! You’re an inspiration, thank you for your content. And congrats on your achievement! Thank you so much for being so transparent with us! 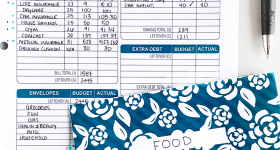 I have always been a paycheck budgeter but your printouts just make everything so much easier to do ! I love your story and even though many people can not make the payments you did because of our great income you are still so relatable because your a true honest person you don’t lie this crazy lavish lifestyle just because you make greta money ! You are truly doing great work and I hope that you continue to do so! cannot wait for your planner to come out ! Kumiko, didn’t mention all her 3:30am wake up times and 12:00am or later nights she spent on building her business into what it is today! We all have the same 24hrs in a day, it is how you choose to spend those hours that separate the go-getters from everyone else. She WORKS HARD! Harder than most are willing to work and it is paying off! I have been following since September 2018 and she is as real as it gets. Such an inspiring story! CONGRATULATIONS!!!! You are AMAZING! Thank you for sharing your journey. The irony people don’t understand about financial advisors is that especially when they’re getting started, they’re not always swimming in the dough! When I worked for Edward Jones, I started with a salary of $1,000/mo. That wasn’t very easy caring for a family, and working 80+ hours a week with little to show for it. I just found you through Youtube and start reading your blog. I was about to quit thinking that you are another “fake budget mom” that actually has her husband paying everything in real life but fortunately read here your story. Very inspiring! Thank you for sharing! Bless your heart, you have faced your fears and won. Thank you for your story. While my debt is credit card/student loan/medical bills/and even the IRS (the biggest one) I HAVE to believe in myself in order to get this under control. I was a stay-at-home mom for 25 of my 28 yr marriage that ended in 2014. During that time, I lost both of my parents. Spending made me feel better at the moment, but always had buyer’s remorse later. 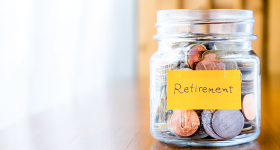 I took money out of the retirement plan that was awarded me in my divorce decree…roughly to the tune of $230,000 which now just leaves me with $35,000 for retirement and I will be 55 next week. Needless to say, I am petrified, ashamed, embarrassed, and feeling alone. You may never get this, but is there in your knowledge somewhere/someplace I can go to for help?